Easter Sunday Mass at 9:00 am. 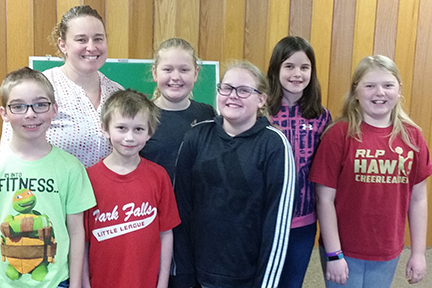 Under the guidance of catechist, Amber Fallos, students in the 4th grade created booklets telling about the eight beatitudes and what each of the beatitudes mean to them. Learn more by viewing each booklet! First Graders Write Thank You Letters to God! 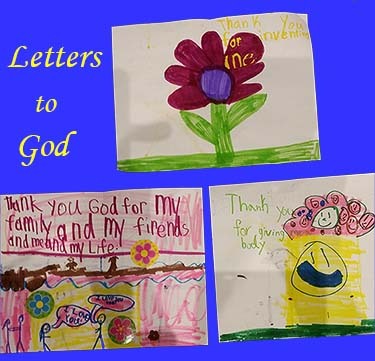 First grade students made beautiful thank you letters to God, which you will find posted in the church entrance. How often do we thank God for all He does for us? A message from our pastor…. Good Shepherd Church is a very welcoming community with dedicated parishioners. 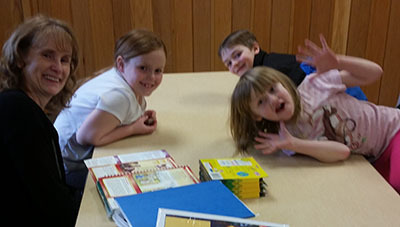 There are many families with children involved in the religious education program. A number of recent projects have made the church and parish hall attractive and functional for religious celebrations such as funerals, weddings and baptisms. I am very happy to have served the parish as pastor for several years. Good Shepherd Church, rectory and office complex is located five miles east of Highway 13, along Highway 102 as you enter into the village of Rib Lake. Come, and join us for Mass! If you are interested in joining the parish, call or stop in! The mission of Good Shepherd is to welcome all to spiritual growth through prayer, worship and ongoing formation. Together, formed in the image of Christ, the Good Shepherd, we will tend to the needs of the entire community. 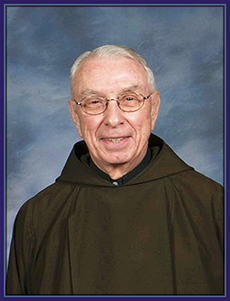 Our parish is blessed to also have a retired priest in residence, Father Dennis Meulemans. Father Den served at Holy Rosary in Medford, and then retired to the Rib Lake area. Father Den assists with Reconciliations at Christmas and Easter, with special events and even preaches every third week at the parish. We are so very blessed to have two wonderful priests residing here. Our thanks to both of them!!! Grandfather (and grandmother) clocks have been around since about 1700; most of them use Westminster Chime sound (old Big Ben in London). I’ve seen a lot more ornate clocks than mine; but I’d certainly miss the beautiful sound of my “friend” if it were no longer usable. But, you say, what does all this have to do with Sunday’s readings? Well, today’s second reading is about the Body of Christ, one of Paul’s most famous texts, immediately before next week’s reading from Chapter 13 of Corinthians—on love—Paul’s best known writing. Paul says the Body “has many parts.” If I take the time to check out the workings of my grandfather clock—the pendulum, the weights, the chimes, the incredible array of little gears, I can’t help appreciating how everything works together to keep me informed of the time, with the bonus of the beautiful chimes. I feel that Paul is saying much the same thing: as Body of Christ we’re all important; we belong. We needn’t be envious of one another, or scornful of anyone, or boastful because of our importance. Like my Seth Thomas clock with all its individual parts keeping the clock running and making beautiful music, see yourself as important towards keeping the Church on track, making beautiful music for the enrichment of others.